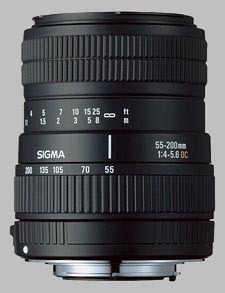 (From Sigma lens literature) This compact telephoto zoom lens was exclusively designed for use with digital SLR cameras. The image circle was designed to match the size of the image sensors of digital SLR cameras that also allows compact body and lightweight. Characteristics of digital cameras were taken into consideration when designing the lens power layout, making high-quality images reality through the entire zoom range. The image circle was designed to match the size of the image sensors of digital SLR cameras that also allows compact body and lightweight a maximum diameter of 71.5 mm (2.8 in. ), and overall length of 87.1mm (3.4 in. ), and weight of only 310g / 10.9 ounces. It has a filter size of 55mm. We took digital characteristics into consideration when designing the lens power layout and created the most suitable lens that makes high quality images a reality throughout the entire zoom range. We used the most appropriate coating for digital products to cut down flare and ghost caused by digital SLR cameras and to produce the best color balance. It can be used with the supplied lens hood to block out extraneous light. This lens has a minimum focusing distance of 110cm (43.3 in.) and maximum magnification of 1:4.5. High performance 3.6x telephoto zoom lens suited a wide range of shooting conditions, such as portrait, sports, nature. The focus and zoom rings provide easy operation in manual mode. A distance scale on the focus ring is an easy to use and convenient addition. Note: Sigma has announced an HSM (Hyper-Sonic Motor) version of this lens for Nikon mount (will autofocus with D40 and D40x, as well as other Nikon DSLRs). You get what you pay - and that's not much. I first thought, I'm to stupid to get really sharp pictures, but the lens just can't do more than about 6 MPix. Also the minimum focus distance is very long (1.1m!). Looks like the Tamron with same spec and comparable price seams to be by far the better choice. I owned this lens for about 6months and used it a fair amount taking several hundred pictures with my Nikon D70. I can't complain about it's overall performance but I found it was not a keeper for me and eventually sold it to my local camera shop for a substantial discount from what I paid. I recently purchased the Nikon 55-200 4-5.6G and can truly say the Nikon delivers substantially better image quality than the Sigma. Nikon recently lowered the price on the 55-200 and I would highly recommend you buy it for the small difference in price. Write your own user review for this lens!